2014 has been my year of Brave. December is going to be here and gone before we know it, and I knew I wanted to mark this month with things outside of my normal Christmas routine. Luckily, I had the oppertunity to do a few festive adventures to kick off the season. As a community of friends, we decided to join our friend LV in his hunt for a Christmas tree. Plus we were able to celebrate our friend Ana visiting from South Carolina for Thanksgiving. Plans were set and we were off to Silverado Canyon. Within 45 minutes, we were surrounded by mountains and rows of glorious Christmas trees. If you are in Southern California, you are most likely not presented with the "tradition" of going into the woods to cut a Christmas tree. We are more accustomed to the year round Palm. The closest thing that I ever experienced to cutting a actual Christmas tree down was watching The Griswolds. 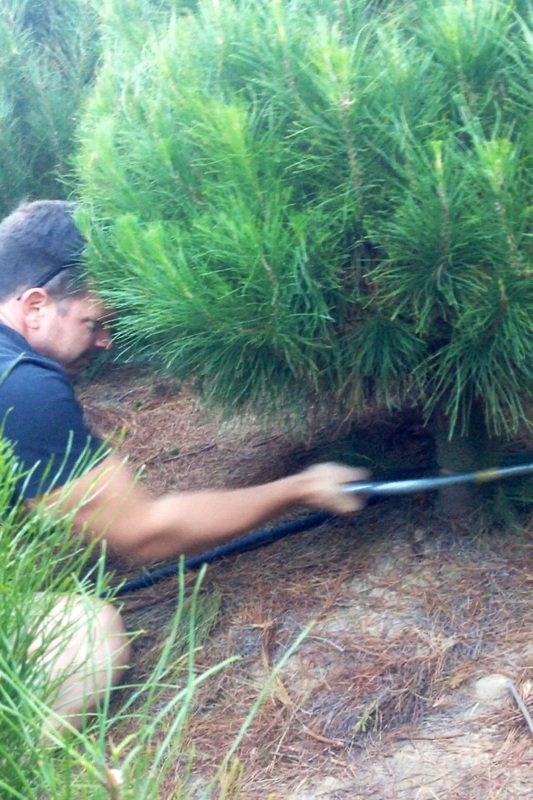 This is my friend Bryan (we traveled to the Olympics together in 2012) who had the honor of cutting the tree. It was such a great day! I highly recommended this adventure if it is available in your area. 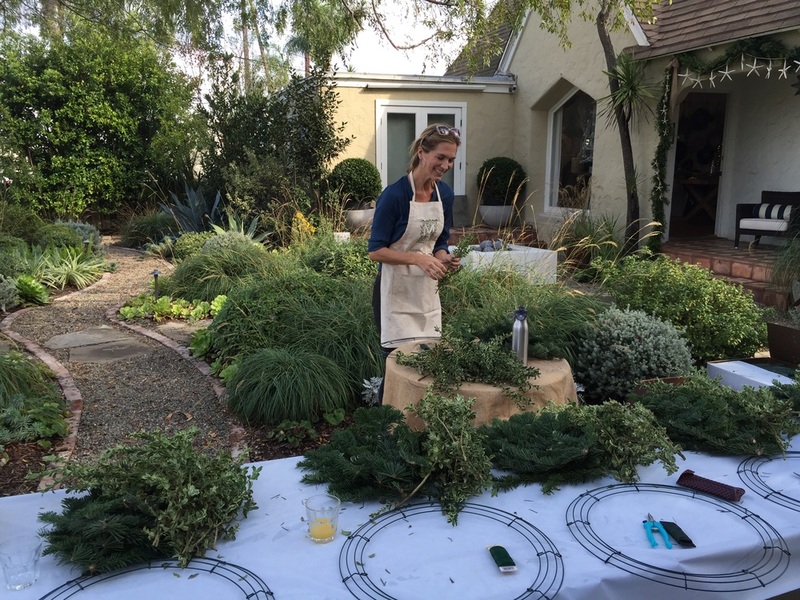 Mollywood Garden Design was the perfect atmosphere to start the holiday season with a wreath making party. I hope to keep this tradition alive every year. While cutting a tree may not be feasible each year, creating a wreath has potential to be a lifelong tradition. Molly (pictured) set us up with many different types of Christmas greenery to choose from, including our native California Silver Dollar Eucalyptus! We started the project by overlapping bundles of trimmed branches. Then we would attach the bundles to the wire frames. 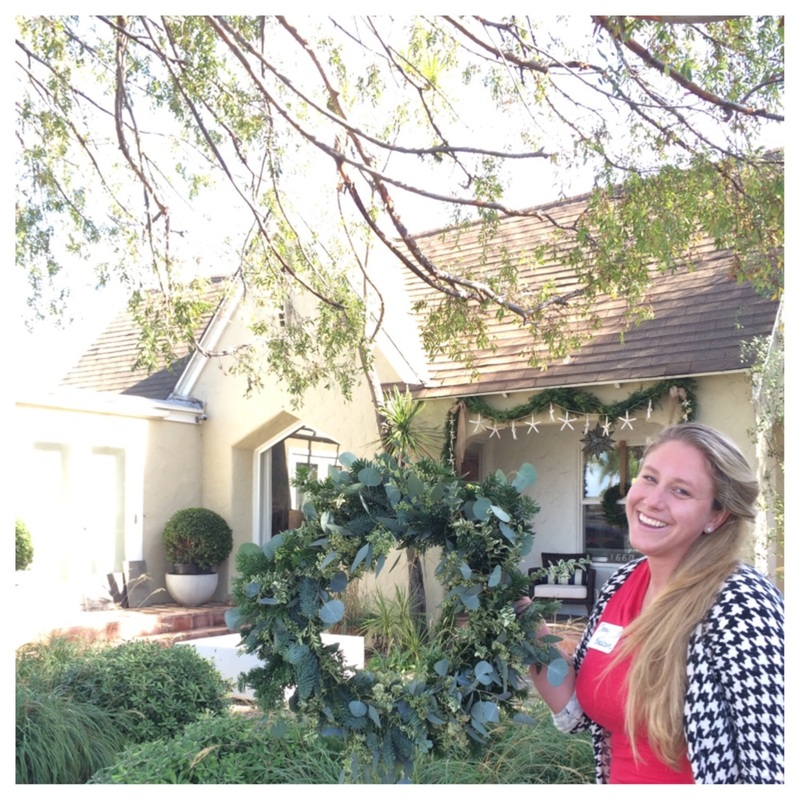 Within a few minutes we were forming our very own California Christmas wreaths. This is my extreamly talented friend Mindy. A pro bundler, and fantastic relaxed multi tasker. We both had a blast catching up, designing and ringing in the season. I am proud of this wreath! This will be a great holiday tradition for years to come. Give it a try, I highly recommend the way your house will look and smell when it's completed. Lastly, I love to support companies and non profits with a cause. What I love about this approach is as they invite people, they strategically create a safe space for all people to learn more about their unique story. Did you know that all the jewelry is handmade by women in Uganda? It is amazing how a product, as simple as a necklace, is bridging two cultures. Here is their video campaign from Christmas 2013. They have expertly combined the marketing of traditional companies with the purpose of a non profit. 31 Bits also invite their "bitsers" to host Holiday jewelry party's. This approach involves their customers in a meaningful way. Now they become a active part of the story and growth strategy. It was so fun joining in the festivities this week! I'm sure there will be more to celebrate in weeks to come.